Grimaldi cultivate about thirty hectares of vineyards between the Langhe and Roero, in some of the best plots in the hills recognised by UNESCO as World Heritage Sites. 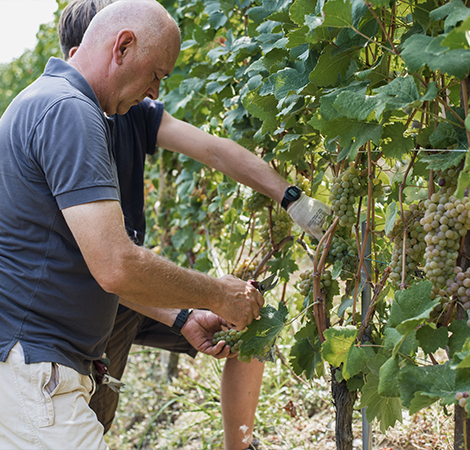 In over a hundred years of working in vineyards, the Grimaldi family have learned to recognise the most suitable areas and have enhanced them by planting the best varieties of vines in relation to the soil, altitude, micro-climate and orientation. Choosing the best variety of vine for each area means obtaining the purest expression of the terroir, capturing the real “spirit” of the Langhe and Roero, one of the most important winegrowing areas in the world due to its oenological richness and the variety of wines produced. Bricco San Biagio is a vineyard in the municipality of La Morra, historic cru belonging to the Barolo appellation. It is a steep, trapeze-shaped plot, with excellent orientation to the South-East – South – South-West. The land, composed of whitish marl and blue tufa, looser and more sandy compared with other areas, yields a Barolo that is ready to drink, of a medium structure, quite soft and perfumed. The particular shape of the vineyard and the steepness of the terrain require extreme care when working on the terraces to avoid hydro-geological erosion. 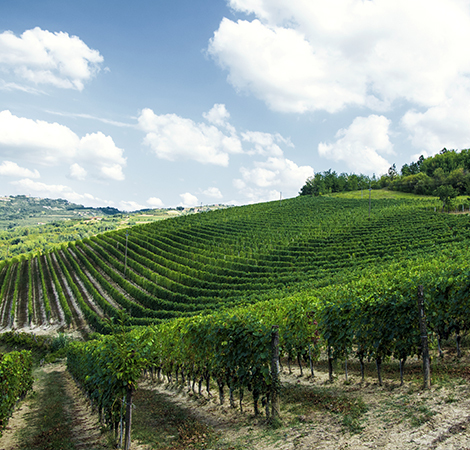 Sorano is a Barolo vineyard in the municipality of Diano d’Alba and takes its name from the nearby hamlet. It is on the side of a hill at medium altitude with excellent orientation towards the East and a slope facing South. Here the sun reaches the grapes in the morning and continues through to the early afternoon. The soil is calcareous tufa well suited to nebbiolo, yielding a wine with good structure and longevity. In Bricco Ambrogio, the only Barolo cru in the municipality of Roddi, is located this vineyard which extends in a compact, rectangular shape from the bottom of the hill almost to the summit. The South-East orientation and the chalky-tufaceous soil are ideal conditions for the cultivation of nebbiolo vines which yield a particularly perfumed and structured Barolo. Within a vineyard which is located in the municipality of Treiso over an area of 8 hectares, is marked out a dcg of 1.3 hectares with the Manzola appellation, from which we produce our Barbaresco. A long, narrow plot, which occupies the side of the hill from the foot to the summit. The land, composed of whitish marl, yields a Barbaresco with a pronounced perfume, with a typical, clear colour, not too deep, with a good body and good longevity. The rest of the vineyard is used for barbera, dolcetto, moscato and chardonnay. At Diano D’Alba, within a vineyard of 4.8 hectares, we own 2 hectares which fall under Sorì Montagrillo, cru of Dolcetto di Diano d’Alba, from which we obtain the wine of the same name. The plots cultivated here are divided into two parts: the first, where we grow dolcetto and barbera, is adjacent to the Groppone winery, the other is located at the top of the hill, and from those vines, which are over 60 years old, we make Barbera d’Alba Superiore “Vecchia Groppone”. The soil, composed of calcareous whitish marl, yields wines that are fresh and perfumed, fragrant and vinous, with a deep colour and excellent body. Valmaggiore is one of the most suitable and prestigious areas of the Roero. A wide, steep hillside crowned by a wood, which mitigates the temperature, keeping it cool. The micro-climate and the very soft, sandy soil which allows the roots of the vines to breathe, yield an aromatic Roero Arneis, fresh, delicate and always elegant. Campè is a vineyard in the municipality of Diano d’Alba, and takes its name from the nearby hamlet. Here we have two plots, one planted with nebbiolo and the other with barbera. The first is on a hillside at about 250 metres, facing South, with calcareous marl soil. It yields an elegant, drinkable nebbiolo. The second plot, which faces West and is at the same altitude, is cooler, with more clay, suitable for a simple Barbera d’Alba, bringing out the fruitiness and freshness. Bricco del Gallo is a splendid vineyard of 4 hectares in the municipality of Sinio. It is altogether in one plot, embracing an entire hillside, up to the slightly rounded summit. In the part facing South-East, warmer and sunnier, with chalky, tufaceous soil, we cultivate nebbiolo. The area to the East, which rises from the valley to the peak, cooler and with more clay in the soil, is used for barbera and dolcetto. The wines from here are very perfumed, with clear colours, and with good structure and longevity.